The Lobos varsity football team gets a big reception. LONGVIEW, TX (KLTV) - Hundreds turned out in support of the Longview Lobos football team at a parade in Longview after their state win. 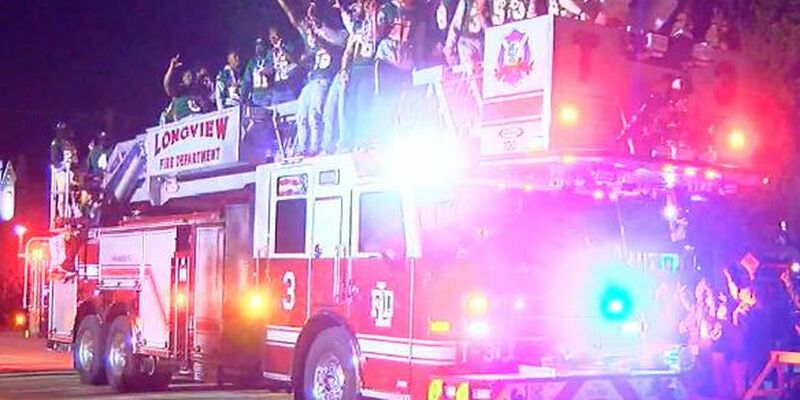 “Ladies and gentlemen here are your 2018 class 6A Division 2 State Champion; Longview Lobos!” The parade MC said as the team rode by. Fans, family and friends lined the streets in downtown Longview as about forty parade entries went by. The entire team and coaching staff were all in the parade, and were given a blazing ride courtesy of Longview hot air balloonists. The Lobos band ushered in the champions. Four thousand commemorative footballs were handed out, and if anyone there needed Lobo gear, there was plenty for sale. The last time the Lobos took state was 1937.